Bigger books, more technology, and plenty of space are features of a new River Heights library set to open in 2021. A bigger book collection, more technology and plenty of space are features of a new River Heights public library set to open in 2021. 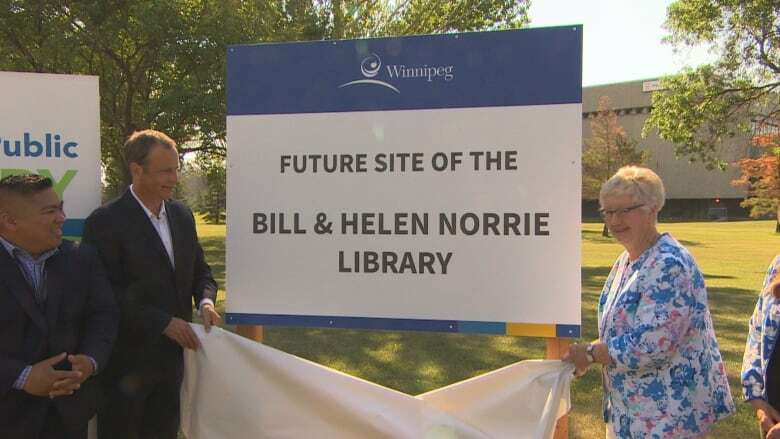 The site for Bill and Helen Norrie Library— named for the former mayor and his wife, who was a teacher and librarian — was unveiled Friday morning. The new library will be northwest of the Pan Am Pool, near the intersection of Poseidon Bay and Cambridge Street. It will take up 14,000 square feet in the Grant Park campus and will replace the River Heights Library at 1520 Corydon Ave.
"I'm feeling very happy," said Helen Norrie, who spoke at Friday's unveiling ceremony. "It's very nice to be here and it's a real honour to have this new library named after Bill particularly." Bill Norrie was mayor of Winnipeg from 1979 to 1992. He died in 2012. The library will have space that can be rented out by groups in the community, an outdoor reading library, accessible parking and easy access to public transportation. It is part of the Grant Park Recreational Plan, which will make the arena, playground, pool and new library in the area accessible to all. "The previous library that we all know and love, it had some strong limitations," said River Heights-Fort Garry Coun. John Orlikow. He said the Corydon Avenue building will eventually be converted into a daycare. "The neighbourhood just grew and the area's grown. We needed to have a much more modern library that can offer more services." Orlikow filed the motion to have the library named after the Norries, which was voted in by city council on June 21, 2017. "It'll be a lasting legacy for the Norries and a positive community gathering place for all of our citizens especially those here in the ward for many many years to come," said Mayor Brian Bowman at the naming ceremony.